Posted by Jeff (ILoveCapitalism) at 5:28 pm - March 25, 2013. Hat tip, David Houle at Seeking Alpha. The “EM” means, a whole bunch of Emerging Markets economies. 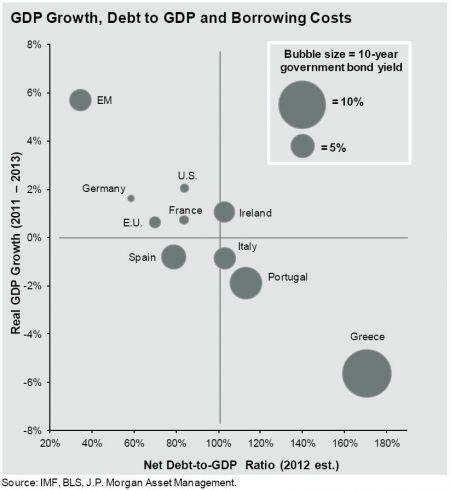 The picture shows that the higher-debt countries tend to have lower growth; the lower-debt countries tend to have higher growth. I would argue that the direction of causation is mostly that policies of high government spending, high deficit and high debt will burden an economy, slowing its growth. But one could argue for at least some causation in the other direction: if a country is low-growth to begin with, it will be higher-debt, just because it can’t grow out of its debts as easily. My counter-argument is that it almost doesn’t matter: The picture suggests that, once your country is stuck in a high debt / low growth mode, adding more debt (or Keynesian “stimulus”) just makes you Greece.